There is no smoke alarm system in my apartment. That is quite a discovery, you must be thinking. My new found friend, who has lived in Bonn for over 10 years now, keeps telling me that I know places in Bonn that she does not. I have been here 17 days already and I have walked the town that is why. Bonn is a small quiet city: and yes if you are whole heartedly walking 30 min is enough for you to go round the city centre. The rest, Bad Godesburg and Siegburg are all not more than 30 minutes away by tram or train or bus! I am told that there are villages around here…..too. Cannot wait to see those! Back to the no smoke alarm bit, ..
One of the danger of living alone is fear of the unknown, because anything can happen! So how did I did I find out that there is no Smoke alarm. About 3 days in my apartment, I go shopping. I am with the Togolese Heinz Kuhn fellow who has been here a month…Oh did I tell you that I am the first recipient of the Heinz Kuhn Scholarship from East Africa in over 10 years! Oh yeah baby..that is me! The Smoke alarm:- So after shopping , foodstuffs and all, I decide that I want to cook. Or rather make use of my fully fledged kitchen. The cooker has 4 plates: cool huh? I am kind of a health freak, so I am using Olive Oil. Those of you that cook know that it thin oil. You should never wait for it to smoke, that is why it is good for stir frying and all! Am used to gas back at home which can easily be controlled…So I think I forgot. I was trying to pan-fry the sausages and boom the pan caught fire. You should have seen me! I was in a frenzy..So I wet the rug and just dropped it in the pan, by then the pan was already on the floor! And after about a minute and a half the fire was out, but my floor had a dent: a cute black ring! The smoke alarm never went off! Second time: I want to light candles. There are candles everywhere here. Lots of them in the shops, supermarkets , kiosks : everywhere. They come in all sizes shapes and are either scented or not. So I buy candles- cute vanilla cream scented Tea-lights they are called! I guess I wanted to feel the Bonn thing! Then comes the problem I need to light them. So I head down to the kiosk….there are no match sticks here or if there are – I haven’t seen them yet, so I have a lighter. I ask for the cheapest, and it costs 60 cents. I ask if it works, he checks it and then I pay for it. I run up the stairs (I live on the 3rd floor) excited that I am going to have a vanilla cream scented living room! I get there and try the lighter and I fail: Truth is I am scared to light it. I do not know why! I just cannot: I keep trying, I can smell the spirit but no fire….My mind is ahead, and I think: wait, I have seen my mum get fire off a plate..Question is how? I do not remember. But I think let me try…so I look for paper and light the plate and wait for it to warm up. When I put the paper, it starts to smoke, I was kinda expecting the paper to burst into a flame but it does not.. With the whole room filled with smoke, villager I think to myself! (Up to now, I have not lit those candles!) There is no smoke alarm, otherwise it would have gone off, and the question is what would my story be? I wonder! I last heard those smoke alarms in Uni…and they would make a lot of noise…. Anyhow, the drama on my side is just getting started, with or without a smoke alarm, God has been on my side…it could have been worse, I mean I live alone…..Half these times I wanna kick the wall, because that is all I can afford to do and maybe tweet about it, if I remember,,…But usually everyone is going about their business by the time I log onto whatever social media! But that is not the issue! All I can do is shed a tear, and say thank you God that I survived…I mean who knows: again It could have been worse! 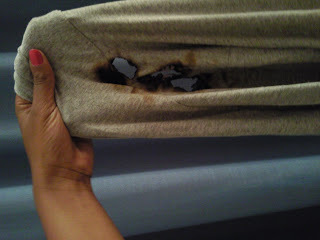 The Photos: the damage done to my cute little sweater and the Lamp that did it! I will tell your Mama! hehehe…Am sure she will understand! Sorry love, i'm sure you'll get the hang of it soon. Kabale ni hare! Stay safe, but live. Many of us miss out on life because of the caution. Live! I say, and enjoy.